We'd been invited to the first birthday party of a friend's baby, and about a week before the party I suddenly realised we hadn't given any thought to a present! I should point out that our friend was very organised and gave us plenty of notice - it was just me not paying attention that gave this problem its urgency. A little nervously, as I wasn't entirely confident in my knooking skills, I decided that making some item of clothing would be a good idea. 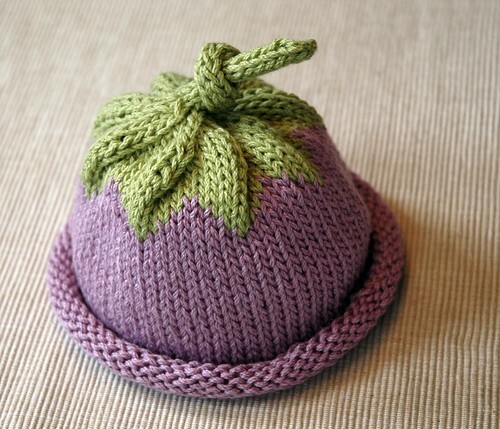 I went over to Ravelry to look for patterns, and found this very cute berry baby hat, with a free pattern. Even better, the pattern looked fairly easy and was written in a very beginner-friendly style. Even I might be able to follow it! Two sizes of needles were called for, so I grabbed a holly stem that I'd saved from putting holly leaves on the peas and set to work whittling. Because the long stem tapered, it wasn't difficult to find two sections of different thicknesses, and thus I added two new knooking hooks to my set. I then went shopping for yarn. Although it sometimes seems that every other shop in Aberystwyth has a few balls of wool lurking in a corner, and there are two shops with what looked to me like a huge range of yarns, it turned out to be quite difficult to get exactly what I needed. The pattern called for Worsted weight yarn, cotton with a bit of acrylic to give it some spring. I find the displays of yarn completely overwhelming, so I asked for help finding what I needed. The first attempt at help was less than helpful; the lady in the shop reeled off all the cotton mix yarns she had available. I asked a second time, in a tone intended to convey complete cluelessness, and she pointed me towards some 60% cotton, 40% acrylic yarns. That sounded a bit high on the acrylic to me, but by this time I was in no position to argue. They weren't worsted weight, either, but double knit, but I thought I could cope with 22 stitches to 10 cm instead of the pattern 20 stitches. Having thinner yarn meant thinner knooking hooks were required, so I made a couple more, then realised I already had one of the smaller size needed, which was no bad thing as the smaller new one wasn't very good. I now have a pretty good set of hooks, though I don't suppose that will stop me making more. After a couple of false starts - running out of tail in a long-tail cast-on then forgetting to add the eight stitches to make it toddler-size instead of baby-size - I made the hat very quickly. As I'd expected, knooking lends itself to working in the round. There was no need to switch to a set of double pointed needles towards the end, as would be necessary for knitting (though I was dropping the stitches onto the cord very frequently, which tended to make them too tight). I started on Friday evening, then started again on Saturday morning after undoing the false starts, and finished on Sunday morning. It was a pretty quiet weekend - Ian's sister was staying, and we did a lot of sitting around chatting and doing very little, which was lovely - and I think I spent about 6 hours on the hat, not counting the false starts. It looked a lot like the photo on the pattern - I'd even used the same colours - but it was very small! It did stretch a bit, but I couldn't believe even a one-year-old's head would be that small. Tip: If you want a hat to be stretchy, don't weave in the long end of the wool by running it all around the edge of the hat. I pulled it all out and wove it in a different way, and the hat was a lot more stretchy after that. Still, I was worried it would be too small. At the party, I was a bit insistent about the present being opened and tried on, even though the birthday girl was a bit tired by then, because I really didn't believe it would fit, and if it was too small I could always make a bigger one. Tired, but still very cute. Of course, she liked the wrapping paper much more than the present! I was very pleased, and a bit surprised, that it fits. Let's hope it still does in the autumn, when she might actually need it.